Evan Spiegel is known all around the world as the co-founder and chief executive officer of the popular social media company Snapchat, which he co-created in 2011 while still an undergraduate at Stanford University. This ingenious brainchild of his has since blossomed into a global brand which has yielded immense financial rewards for Spiegel and his collaborators making him one of the world’s youngest billionaires. In addition to his brilliant career as a tech executive and entrepreneur, Spiegel is also famous for being one half of a celebrity couple, the other half being his international model wife Miranda Kerr, a former Victoria’s Secret Angel. Evan Thomas Spiegel was born on June 4, 1990, in Los Angeles, California. He was raised in LA’s coastal neighborhood of Pacific Palisades. His father, John W. Spiegel and his mother, Melissa Ann Thomas are both lawyers. He has two sisters Lauren and Caroline Spiegel. He was raised in the Episcopal church and had his high school education at Crossroads School for Arts and Sciences in Santa Monica, LA County. While still in high school, he took design classes at the Otis College of Art and Design and upon graduation, he studied briefly at the Art Center College of Design in Pasadena before heading off to college. Spiegel had his college education at Stanford University where he majored in product design. As an undergrad, he conceived the idea of creating an ephemeral messaging application as part of a product design course project. The idea seemed really ridiculous to his classmates and they initially laughed it off. However, Spiegel set to work on that concept alongside two other schoolmates – Bobby Murphy and Reggie Brown – and together, they launched a prototype app “Picaboo” in July 2011. Picaboo was ultimately relaunched as “Snapchat” on September 16, 2011, and by that time, Reggie Brown had been ousted from the venture. 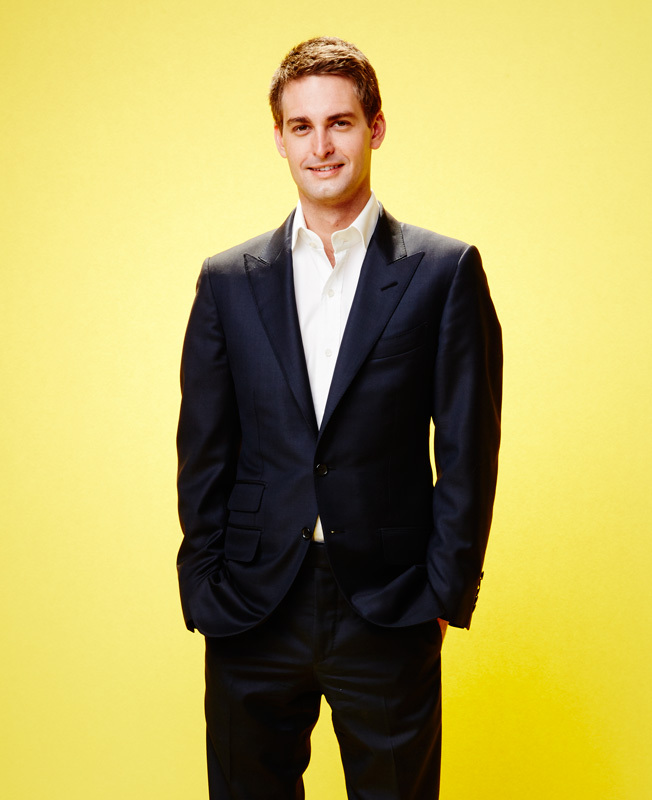 The popularity of the Snapchat app grew in leaps and bounds and by 2012, Evan Spiegel quit college to focus on its development. After nearly 6 years, Spiegel returned to Stanford to complete his college degree in 2018. Evan Spiegel holds 48% of the voting power of the multibillion-dollar Snapchat Inc. and his net worth is pegged at an astonishing $1.5 billion. For obvious reasons, Spiegel’s net worth is closely tied to the market value of his Snapchat Inc. company. As of October 2018, the tech CEO had a net value of $2.3 billion and was ranked at number 354 on the Forbes 400 list, thereby retaining his standing as the youngest billionaire on the Forbes 400 list for the fourth consecutive year. Apparently, the market forces took a great chunk off his earnings to bring it down to its current value. Snapchat Inc. went public in March 2017 and thus, Evan Spiegel became one of the youngest CEOs of a public company in the world. Obviously, Spiegel has the Snapchat application to thank for putting him on the world map. However, its parent company has since snowballed into a global conglomerate which consists of a diverse array of subsidiaries. The evergrowing company now includes smaller tech companies and startups and it has continued to expand thanks to the development of several other ingenious apps and products. As expected, the company has equally received several takeover bids from its competitors including Facebook CEO Mark Zuckerberg as well as tech giants Google. However, these juicy bids were all turned down by Evan Spiegel and fellow co-founder Bobby Murphy. Evan Spiegel is very much married and his wife is none other than Australian-born supermodel Miranda Kerr. In addition to her illustrious modeling career, Kerr is also a beauty entrepreneur having launched her own brand of skincare products “KORA Organics” in 2009.. This picture-perfect couple got engaged in July 2016 and a little over a year later, they got married on May 27, 2017. Theirs was a private ceremony held in Los Angeles. Interestingly, Spiegel’s wife revealed that the billionaire is an adherent to the conventional practice of “sexual abstinence before marriage”. The couple announced in November 2017 that they were expecting their first child. They welcomed their first child on May 7, 2018, a son named Hart Kerr Spiegel.